Look at that. Do you see that beauty of a book cover? Isn’t it positively beautiful? It’s been a year now that I have been working on this cookbook, what started out as a “maybe in the future” idea turned into a hear and now idea, and it’s something that’s nearly finished. 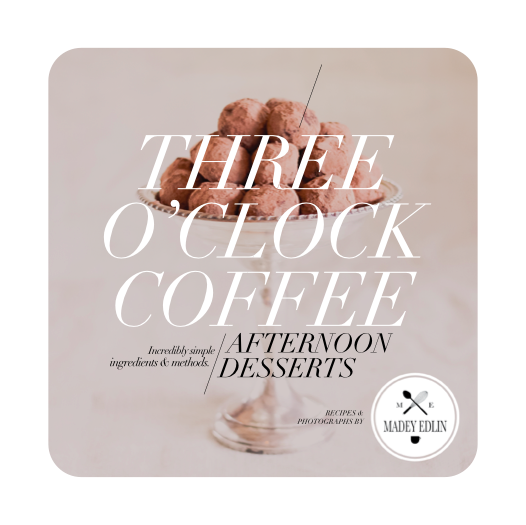 I can’t give you a release date, yet, but soon, very soon you will know when you can order your own copy of Three O’Clock Coffee. Ah, doesn’t that sounds nice? Your very own copy of my book. I will tell you that things are coming along nicely, and I am exceedingly happy about how things are looking, I CANNOT WAIT to show you more of the book! Cheers for now, my dears. This entry was tagged Cookbook, food, madey edlin, photography, Three O'Clock Coffee. Bookmark the permalink.